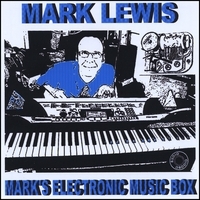 On Mark’s Electronic Music Box, jazz sax master Mark Lewis explores the possibilities of finding the soul of the electronic keyboard to showcase some of his compositions in a range of styles and moods. Old and new mix. The opening and closing tracks of Mark’s Electronic Music Box recreate the delicate sound of a mechanical music box – porcelain dancers turning in circles until their dance winds down to silence. The hauntingly lovely “Not as Beautiful as You” is presented here as an orchestral work. Great attention went into making each electronic voice sound like an instrumentalist of its acoustic counterpart had played the part. Feel the presence of the exposed yet unwavering oboist and the patient, elegant harpist as they perform flawlessly on this masterpiece of melodic and harmonic composition. Big band swing returns in “Anita,” written for a dear friend from that generation. “Sacred Love” showcases Mark’s artistic mastery of the flute over an ethereal backdrop of rich electronic textures. “Bill’s Airshow” is a mischievous piece complete with airfield sounds, playful commentary, and some seriously persuasive bluesy piano and sax. All healing is possible with “Medicine Song.” The guitar voice comes to center stage in this fresh and sparse song of hope. Mark Lewis is master of the alto sax, baritone sax, flute and piano; author of over 1400 compositions; and has recorded and produced over twenty albums on various labels. He is an internationally acclaimed jazz artist who combines extraordinary technical virtuosity with unsurpassed integrity and personal expression. Rotterdam, The Netherlands was Mark’s home base for many years. He toured and played in most of the better clubs throughout Europe, and taught jazz theory and improvised music classes in several music conservatories. Although he performed predominantly original music in Europe, he is also master of a vast repertoire of jazz standards. Mark lived and performed for several years in San Francisco and Victoria, BC as well. Jazz musicians Mark has performed and recorded with include pianists Mark Levine, Overton Berry, and Ted Gioia; drummers Candy Finch, Eddie Moore and Billy Higgins; bassist David Friesen; saxophonists Johnny Griffin and Art Foxall; trumpet player Randy Brecker; and vibraphonist Bobby Hutcherson. He often subbed for Stan Getz and John Handy during his time in San Francisco. "It’s almost extraordinary the range of things he’s capable of doing. You listen to the guys with the primo recording contracts on the very top labels, and in my opinion, they’re not in Mark’s league."